What are the Benefits of Using a Wireless Fence? Since the first wireless pet fence was invented in 1973, advances in technology have helped create a truly ideal situation for both dog and owner, an environment where the four pillars of exceptional dog ownership- safety, comfort, freedom, and security, intersect elegantly and effortlessly. Safety from their own inborn impulses to run away, dig, and get into trouble; comfort and security knowing their limits, and the freedom found in enjoying a mostly off-leash existence, inside and out. Busy salesman and pup lover Richard Peck had started noticing an unsettling sight as he made his way through the newly-sprawling suburbs that occupied the space between sales calls. Almost daily, on the side of the road would be a dead or severely injured dog, usually a beloved family pet, who had somehow gotten loose from his home and yard, only to meet his demise in the middle of a dangerous street. Determined to come up with a solution to help keep these dogs enclosed in their own yards, and out of the traffic, Peck contacted an electrical engineer and, after many iterations and prototypes, finally came up with the simple system still in use today. This system, unchanged since it was patented in 1973, consists of just three elements: a small transmitter box, a lightweight collar-receiver, and a thin, flexible wire. The business built up slowly, through the catalog and mail-order marketing. Its original classification as an “electric dog fence” put off most owners, who thought the wireless fence was at best a joke and, at worst, an instrument of animal cruelty. However, as the suburban sprawl continued, and droves of pup owners moved into their dream homes, they found themselves in a dilemma: often, their home owner associations (HOAs) explicitly forbade any kind of alterations to the home, and this applied to fencing. What was a good owner to do? Esteemed dog-aficionado magazine Dog Fancy ran an article, in the 1980s, about these new, game-changing wireless fences and how they were a pup owner’s best friend. This endorsement, and a new name, “wireless fence,” helped create a wave of momentum that has not abated. Dog lovers flocked to their pet supply stores, and, eventually, the internet, to purchase and install these innovative fences. A wireless fence will help you keep your dog safe. Safe from busy streets, safe from hostile neighbors, safe from the injury that a traditional fence can cause. Dogs love to dig, and they love to climb. A particularly aggressive or curious canine can find himself caught in metal wires or splintered wood when an escape attempt goes wrong. With a wireless fence, your dog, wearing his lightweight, barely-there collar, is trained to understand his new limits, and, like all smart dogs (and they are ALL smart,) will respect those newly-imposed limits. The mistake of putting the words “electric” and “dog” too close together in the product description almost killed off the entire industry. Dog owners, likely with thoughts of electric cattle fences in mind, wanted no part of this inhumane-sounding device; they would just take their chances. Re-named the invisible or wireless fence, consumers took a long, second look at the options, and took the plunge. 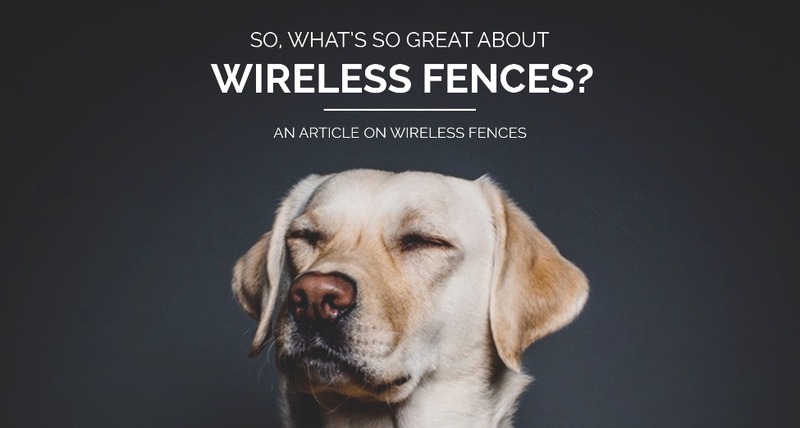 Although popular media still lampooned the image of the poor canine confined behind an ominous and invisible force, wireless fence owners knew otherwise, and word-of-mouth helped already-robust sales grow exponentially. Their dogs seemed happier being able to roam freely in their own yards, and the owners had peace of mind knowing a reliable barrier was protecting their pet. The mild sensation that lets the dog know where to go, and where not to go, is not the violent, unpleasant, taser-like shock that some misguided activists would have you believe. It is akin to a TENS machine, which you have probably seen (or even used) at your chiropractor, to relieve back pain. This sensation barely rises above the “tickle” or “did I just feel something?” level. It is just enough to notify your canine of his perimeter, plus its intensity is customizable, based on how persistent your dog can be. While dogs are valued for their unconditional love and steadfast, unwavering loyalty, dogs themselves value the freedom to roam and to protect and monitor their “pack.” (i.e. you and your family.) Allowing your dog to roam freely on your property ironically helps create even more trust and respect for YOU. Dogs need plenty of this off-leash playtime. Living in a suburban environment requires a leash, and many cities have strictly-enforced leash laws. Having a wireless fence creates a spacious, open environment that signals to the pup that his world is wide open and brimming with potential adventure. He can easily survey the surrounding area and is not beset with the anxiety that a tall fence can provoke. The freedom to wander to and fro in his own yard, while monitoring potential threats, will instill a crucial sense of purpose and place, critical to a dog’s happiness. As it is well known, dogs are pack animals and will modify their behavior in order to enjoy the security of membership in a pack. You, the dear reader, are now his pack, and you need to create the conditions to foster this sense of security for your precious pet. The wireless fence’s third element, the thin, flexible wire, is buried in your yard to your specifications. It also comes equipped with a special notification when it is damaged or disturbed (thank you, modern technology), so your wireless fence system will alert you immediately if something is amiss. This provides security for you, of course, but it is the ability to design certain off-limits areas, even within the wireless perimeter, that will create added security for your puppy. For example, you can create a secure boundary around a pool, a garden, trash cans, or landscaping. This will keep your pet safe, and, more importantly, out of trouble! Decided to tear out the landscaping and put in something else? No problem. You can easily re-route the wires to protect the new developments. 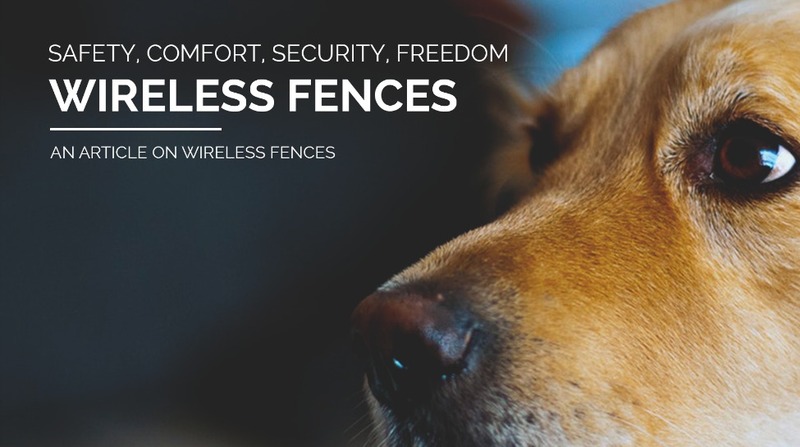 We could go on and on, but, suffice it to say, a wireless fence’s benefits will serve you and your dog in many ways and for many years to come! All eyes on the newest Invisible Pet Fence Technology!